Back in April we had a family trip to Sydney. Basically it was 24 hours of enjoying the amazing Sydney Autumn weather at Coogee Beach, checking out playgrounds and eating out. The highlight of the trip (for me) was dinner at Firedoor in Surry Hills. Firedoor chef Lennox Hastie worked for years at Asador Etexbarri, one of the Top 10 Best Restaurants in the world. He know’s a thing or two about cooking with fire. We couldn’t resist ordering the aged Rib Eye on the bone. Served simply with a green salad, it was seriously ah-maz-ing. It got me thinking about how much I love a good steak. And that sometimes it’s great to give steak the Firedoor simplicity treatment, sometimes it’s nice to add a few simple seasonings. We’re chopping the steak before cooking and serving it with a simple balsamic dressed salad and creamy ricotta for temperature and textural contrast. An all-time fave around here! Salt and viengar was one of my favourite chip (crisp) flavour combinations. Love the tang of the vinegar with salty goodness. It work even better with steak! A modern take on steak, with soy sauce and chilli to flavour and zucchini ‘noodles’ for texture. Simple. Good. The herb and chilli oil is super easy to make. Just finely chop the herbs while your steak is cooking and stir together. Love how the steak juices combine with the fresh verdant oil to form a flavourful sauce. From my Parisian friend’s beautiful book. The simple herb butter really takes steak to a new level. My Irishman and I may or may not have eaten the whole 6 servings of butter between us. Reminds me I need to experiment with more flavoured butters. I can’t get enough of the combo of olives and goats cheese. It’s salty, briny, tangy and creamy. Just the thing for bringing a piece of steak to life (or chicken or lamb for that matter!). And if you haven’t ever cooked minute steaks, you definitely need to try them! By bashing out the steak so they cook in literally a minute, you not only speed up the cooking time, you get super tender steaks every time. Even from the lesser cuts. 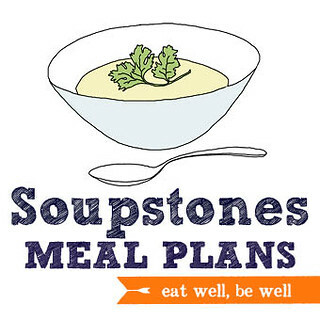 If you struggle with meal planning then check out Soupstones Meal Plans.